No wonder they killed this guy. 1) Financially supports open sedition in major American cities resulting in millions of dollars of property damage as well as loss of life. 2) Attempts to manipulate democratic elections by donating millions of dollars to his preferred candidates. 4) Is a currency manipulator. Soros initiated a British financial crisis by dumping 10 billion sterling, forcing the devaluation of the currency and gaining a billion-dollar profit. It was read aloud in taverns, churches and town squares, promoting the notion of republicanism, bolstering fervor for complete separation from Britain, and boosting recruitment for the fledgling Continental Army. He rallied public opinion in favor of revolution among layman, farmers, businessmen and lawmakers. It compelled the colonists to make an immediate choice. It made the case against monarchy, aristocracy, tyranny and unfair taxation, offering Americans a solution – liberty and freedom. It was an important precursor to the Declaration of Independence, which was written six months later by Paine’s fellow revolutionaries. Paine’s contribution to American independence 241 years ago during the first American Fourth Turning cannot be overstated. His clarion call for colonial unity against a tyrannical British monarch played a providential role in convincing farmers, shopkeepers, and tradesmen reconciliation with a hereditary monarchy was impossible, and armed separation was the only common sense option. He made the case breaking away from Britain was inevitable, and the time was now. Armed conflict had already occurred, but support for a full-fledged revolution had not yet coalesced within the thirteen colonies. 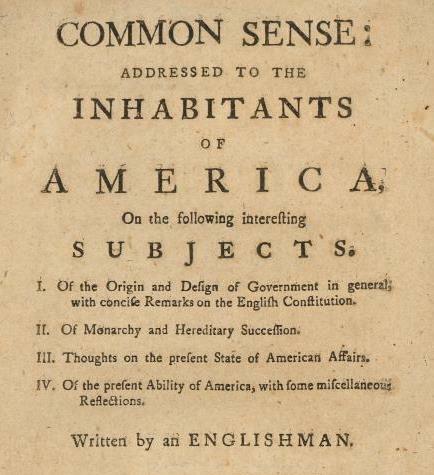 Paine’s rhetorical style within the pamphlets aroused enough resentment against the British monarchy to rally men to arms, so their children wouldn’t have to fight their battles. Will NATO’s “Operation Atlantic Resolve” Be The Trigger For WW3 With Russia? As concern over the last week of Obama’s tenure as President continues to mount and as tensions with Russia edge upwards more and more by the day, the United States and NATO are doing everything they can to signal that they are ready and willing for World War Three. After months of falsely accusing the Russian government of “war crimes,” “crimes against humanity,” and empire expansion simply for killing Western-backed terrorists in Syria, the U.S. government and corporate media followed up with months more of claims of “Russian hacking” even insinuating that the Russians “hacked the U.S. elections.” This was, of course, after over a year of claiming Russia shot down civilian air liners, invaded Ukraine, imprisons gays, and has no rights for women. Over the course of the crisis in Ukraine, the U.S. has repeatedly moved troops into threatening positions close to the Russian border. Now, however, one of the biggest pushes yet has materialized in Eastern Europe, right on Russia’s doorstep in Poland, Estonia, Latvia, Hungary, and Bulgaria. Dubbed, Operation Atlantic Resolve, the massive NATO troop deployment is an obvious act of troop placement in order to prepare for an actual ground assault on Russia itself. At best, it is an incredibly foolish act of bullying and intimidation. At worst, it is preparation for a nuclear holocaust. US tanks and armoured vehicles along with over 3,000 US soldiers begin arriving in Poland on Thursday, (12 January). The deployment, which falls under Operation Atlantic Resolve, is the largest exercise of US troops in Europe in decades. Hundreds of armoured vehicles and over 80 main battle tanks have already arrived in Germany and are reportedly being moved by road and rail to Eastern Europe. Operation Atlantic Resolve is a mission to show Moscow that Washington is committed to protecting its allies in Eastern Europe. It was launched in the aftermath of Russia annexing Crimea, which triggered fears that Moscow could move to make a similar land grab in Eastern Europe. The US Armoured Brigade will also reportedly conduct military exercises in the Baltics. The exercise is a part of President Barack Obama’s plan to ease tensions among Nato allies who are concerned about Russian aggression. According to reports, the forces will rotate every nine months. Tanks and other materials will eventually be stationed in Poland, Latvia, Estonia, Lithuania, Romania and Hungary. Self-propelled Howitzers and hundreds of other armored fighting vehicles were landing on the shores of northern Germany. To those who had at least one eye on the news, it was like watching the US invasion at Normandy all over again. Over the last few days, some 2,800 pieces of military hardware and 4,000 troops have arrived at the port in Bremerhaven. The delivery of US Abrams tanks, Paladin artillery, and Bradley fighting vehicles marks a new phase of America’s continuous presence in Europe, which will now be based on a nine-month rotation. Operation Atlantic Resolve – as it is being called – is the newest phase in adding and keeping a US armored brigade on the European NATO front and will operate on a nine-month rotational basis. With its headquarters based in Germany, the brigade will first enter Poland and then disperse throughout seven countries from Estonia to Bulgaria; a military front much closer to the Kremlin in Moscow than was setup during the Cold War with the former USSR. Since the announcement, Putin has had no choice but to counter the military move along Russia’s borders. Great Britain will also be joining the military surge – sending fighter jets to the Black Sea and a battalion of troops, tanks and light armor to Estonia later in the spring. Those troops with be supported by French and Danish troops while Germany will be bolstering troops and sending tanks into Lithuania. Other counties participating in the “Enhanced Forward Presence” are Canada, Romania, the Netherlands, Albania, Croatia, Belgium, Italy, Slovenia and Luxembourg. The US will also be relocating its Stryker Unit from Germany to Poland to join the vastly expanded military presence. It should be clear enough by now that the U.S. is by no means acting defensively in Ukraine, Syria, Europe or anywhere else. The U.S. government is playing a very dangerous game that could very well end the lives of the overwhelming majority of the planet. Thankfully, Putin has proven to be a cooler head than any leader in the NATO infrastructure and his calm responses are most likely the only reason the world has not been incinerated by now. The American people had better start paying attention to the aggressive posturing of their government and begin speaking out before it is too late. Author Poor DickPosted on January 21, 2017 Categories UncategorizedTags Brandon Turbeville, Drills, geopolitics, NATO, Operation Atlantic Resolve, Russia, WarLeave a comment on Will NATO’s “Operation Atlantic Resolve” Be The Trigger For WW3 With Russia?